The mother that was featured in a now viral photo taken outside the U.S. border in Mexico after being exposed to tear gas condemned the country’s use of it and said that she needs a job, in an interview with BuzzFeed News published Monday. Maria Meza, 39, was reportedly with her five children when they were hit with tear gas after many migrants decided to storm the border. A photo of her grabbing two young children by the arms and appearing to run from the gas went viral. The photo was taken by Kim Kyung-Hoon of Reuters. I brought five of my kids with me yesterday. I was there with them at the wall. I felt sad, scared, and wanted to cry. Thats when I grabbed my daughters and ran. I thought my kids were going to die with me because of the gas we inhaled. We started running, and we fell in the mud, but when I wanted to rise and get up, I couldn’t. Another guy grabbed me by the hand and helped me get up. They know we are human beings just like them. It wasn’t right that they acted that way with kids. They have kids too, and they should’ve thought about their own kids, just like they should’ve thought about ours. It wasn’t right what they did, to throw [tear gas] bombs. I’m praying to God. I know that he will open the doors so that we can enter, or if we stay in Tijuana, he’ll open the doors so they will be able to give us, maybe, some sort of papers so that we can stay and work here. Like I told you, I’m a mother who needs a job. I work to help my kids move forward and give them the best. This is not the first time a photo taken at the border sparked outrage. 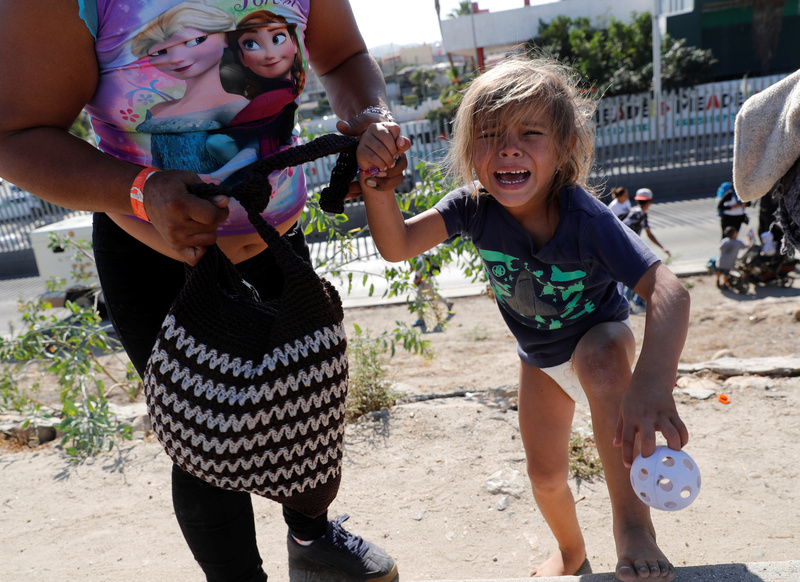 In June, a photo surfaced of a two-year-old girl crying while a border patrol agent was talking to her mother. The photo of Sandra Sanchez and her daughter Yanela gained notoriety as the policy of separating parents from their children at the border was receiving immense backlash. Prior to insidious details being released about Sanchez, she was portrayed as a victim of the policy. Despite the photo being published on the cover of TIME with the little girl looking up at President Donald Trump, it turns out that she was never separated from her mother. She was only briefly set down so that border patrol agents could conduct a pat-down on the mother, according to officials.